Panama should revise its legislation to make it explicit that firearms may only be used when an imminent threat of death or serious injury exists. The Constitution does not otherwise regulate the use of force by its law enforcement agencies. The Constitution provides that Panama "shall not have an Army", one of the few countries in the world that does not possess one.Art. 310,1972 Constitution of the Republic of Panama (as amended through 2004). The acts of the national police are formally regulated by Law No. 18 of 3 June 1997. Article 13 of the Act prohibits torture and other inhumane treatment by the police. 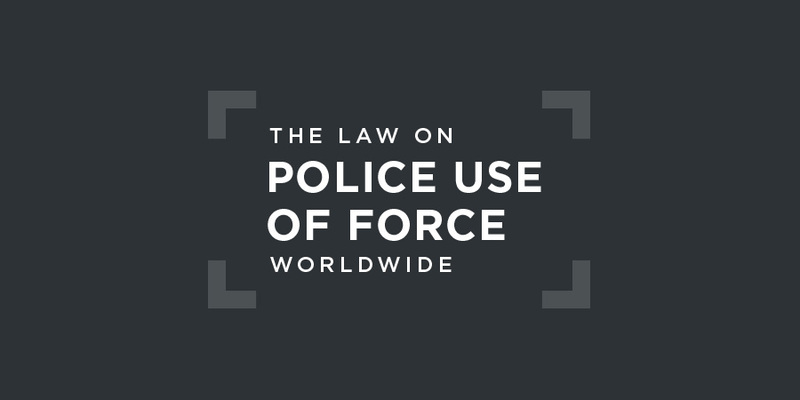 Force may only be used where strictly necessary for legitimate law enforcement objectives.Art. 19, Police Act, No. 18 of 3 June 1997.Article 32 of the Act governs recourse to firearms. These are permitted, where necessary, for the protection of life and bodily integrity in self-defence or defence of others. What is missing is an explicit requirement that the threat be imminent. Firearms may not be used where there is a threat to the wellbeing of a third person or may harm a hostage.Art. 33, Police Act, No. 18 of 3 June 1997. The Public Security Forces of Panama (Fuerza Pública de Panama), includes the National Police (Policia Nacional), the National Air-Naval Service (Servicio Nacional Aeronaval-ENAN), and the National Border Service (Servicio Nacional de Fronteras-SENAFRONT). The three bodies fall under the jurisdiction of the Ministry of Public Security (Ministerio de Seguridad Pública), which was created in 2010. "Panama Ground Forces", Global Security, at: https://www.globalsecurity.org/military/world/centam/pa-army.htm.Panama is said to be one of the few places where police forces have undergone significant reforms to tackle drug violence and is now considered, along with the Dominican Republic and Nicaragua, the only place in Central America where citizens actually trust and have confidence in their criminal justice systems. "Aaron Kovac, "Panama’s Untold Story: Security and Police Forces Step up their Game", International Policy Digest, 15 May 2014, at: https://intpolicydigest.org/2014/05/15/panama-s-untold-story-security-police-forces-step-game/. before turning to the use of force one must exhaust all possible means of persuasion, among them: dialogue with the demonstrators by a member of the Regular Police who is not involved in the intervention of the anti-riot elements, the intervention of the civilian authorities, persuasion using megaphones or loudspeakers regarding the possible intervention of the riot police and the legal basis for their action, allow a prudent time for observing whether the demonstrators are or are not persuaded.Inter-American Commission on Human Rights, Annual Report 2015, §110. Panama also referred to the adoption of Proposed Law No. 152, which modifies Law 18 on the National Police, "insofar as it would restrict the use of shot (of plastic, lead, and rubber), or any type of weapon whose main effect is to cause injuries with fragments that cannot be located by X-ray in the human body, by state security agents, in peaceful demonstrators. "Inter-American Commission on Human Rights, Annual Report 2015, §110. Oversight of the Panama national police is indirectly provided by the national ombudsman, Defensoria del Pueblo. In 2012, a proposal to create a disciplinary tribunal to sanction officers in the security agencies for misconduct was cancelled. Gustavo Perez, the Director of the National Police, said that: "The police must judge the police". Ensure that tear gas is used in strict conformity with the principles of proportionality and necessity[. ]Committee against Torture, Concluding Observations on Panama, UN doc. CAT/C/PAN/CO/4, 28 August 2017, §17(d) and (e). to investigate the entry and smuggling of firearms into prisons and to take appropriate preventive measures. The State party should ensure that all deaths in custody are investigated promptly, thoroughly and impartially and that autopsies are carried out where appropriate. It should also investigate whether prison officials and members of the police are in any way responsible for such deaths and, if so, punish the guilty parties and provide the victims’ family members with adequate redress.Committee against Torture, Concluding Observations on Panama, UN doc. CAT/C/PAN/CO/4, 28 August 2017, §21. the State denied that it failed to undertake a serious and diligent investigation into allegations of torture presented by Mr. Vélez Loor since, in the State's opinion, the obligation to investigate established in the Convention Against Torture “is subject to the existence of a well-grounded reason to believe such acts have been committed. Otherwise, any unfounded accusation that such acts have occurred would require the State to conduct proceedings based on trivial accusations which, far from being useful for the prevention and punishment of acts of torture, would result in a useless weakening of legal remedies. ...Inter-American Court of Human Rights, Vélez Loor v. Panama, Judgment (Preliminary Objections, Merits, Reparations and Costs), 23 November 2010, §239. In that regard, the Court clarifies that the Convention Against Torture contemplates two situations that activate the State’s duty to investigate: on the one hand, when an accusation is filed and, on the other, whenever there is a well-founded reason to believe that an act of torture has been committed within State jurisdiction. In these situations, the decision to initiate and conduct an investigation is not up to the State, meaning it is not a discretional power; instead, this duty to investigate constitutes an imperative obligation of the State which derives from international law and cannot be disregarded or conditioned by domestic acts or legal provisions of any kind. ... Moreover, as the Court has stated, even when the application of torture or cruel, inhumane or degrading treatment has not been reported to the competent authorities by the victim, whenever there are indications that it has occurred, the State must initiate, ex officio and immediately, an impartial, independent and detailed investigation to determine the nature and origin of the injuries, identify those responsible and prosecute them.Inter-American Court of Human Rights, Vélez Loor v. Panama, Judgment (Preliminary Objections, Merits, Reparations and Costs), 23 November 2010, §240.